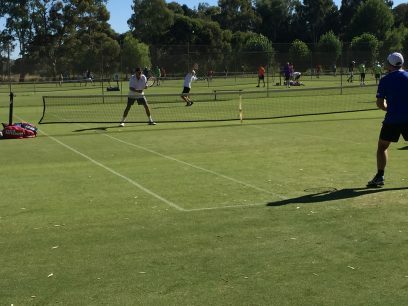 Players from the Merimbula area again attended the Victorian Country Week Carnival of Tennis hosted by the Swan Hill Tennis Club. 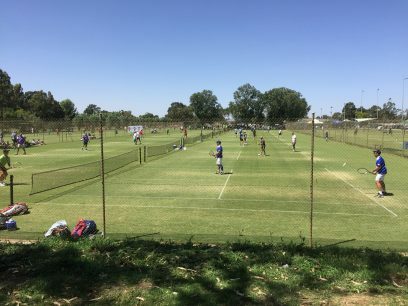 The club has 51 permanent pristine grass courts and another 44 especially prepared on the adjoining soccer field curated and prepared by one groundsman. There was not a weed or bare patch to be seen on the 95 courts. 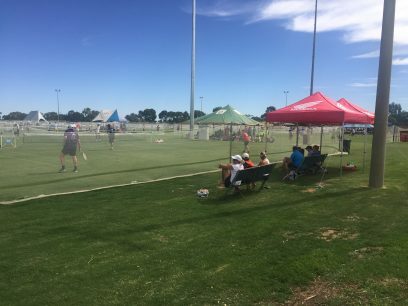 1200 players took part this year in some 200 teams (120 Ladies and 80 Gents teams) playing 24 grades. 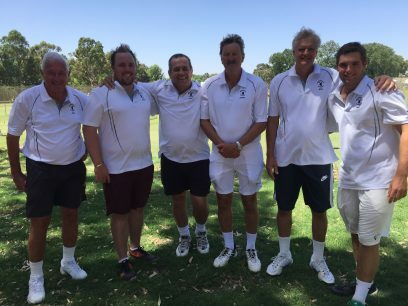 The Merimbula Bunnies team consisted of John Rheinberger, John Gardiner, Stefan Bertella, Dennis Love and father & son pair of Bob & Paul Warren. 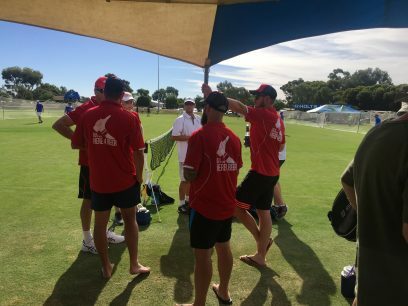 A loss by three games against Bendigo/Horsham out on court 90 started the week but the Bunnies rebounded in the afternoon with a win against Kyabram by five games. 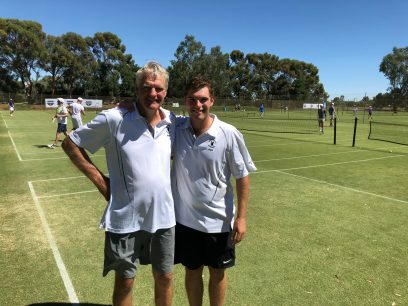 Bob Warren celebrated his birthday on Tuesday morning by playing the morning match against Dubbo with his son Paul and they recorded two victories 8-6 & 8-6. The two John’s followed up with an 8-5 victory and 3-8 loss to record an overall win by two games. Paul & John Gardiner paired for the afternoon match against Camden and recorded two victories. Dennis & Stefan paired to gain valuable games for the team and record a 3 game win for the Bunnies. Wednesday morning saw a strong south westerly wind making conditions difficult for all the players however Bob & John Rheinberger were able to play well in the conditions and record an 8-6 first match win. Paul & John Gardiner followed up with 8-6 & 8-4 sets to give the Bunnies a three set to one and two game victory over Wodonga. Old hands Dennis & Bob paired in the afternoon against Geelong and won both sets 8-6 & 8-7 while John Rheinberger played with junior Paul to pick up the other two sets for the match win. 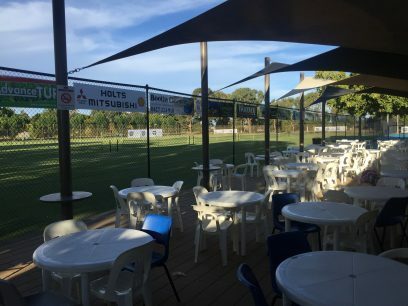 Thursday’s match against West Wyalong was drawn on court 20, right in front of the clubhouse and gave the match some extra atmosphere. Bunnies came away with the first three sets and the fourth set was unfinished at 4 games all. This final win enabled Merimbula to move into first place going into the semi finals with Bendigo in second, Wodonga third and Dubbo fourth after losing their first four matches. All semi finals were scheduled for 4pm and each match allocated two courts. 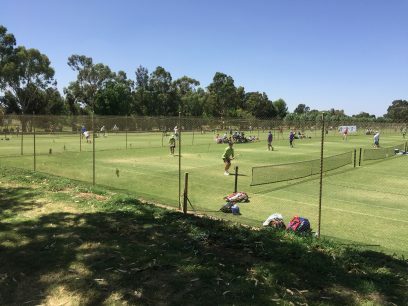 John Rheinberger & Bob Warren took on Dubbo’s second pairing and played tentative tennis with John dropping all three serves while Bob served well to hold his two serves but they went down 2-8. Meanwhile Paul Warren & John Gardiner played a very aggressive high level match and skinned their opposition 8-2 to square the match. 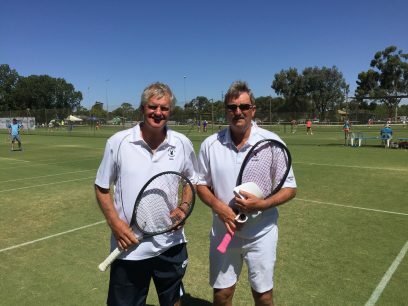 The cross over doubles was no better for John & Bob and they lost 1-8, Paul & John continued their high level of play and won 8-2 however it was not enough to cover the deficit and Dubbo advanced to the finals on Friday morning. Meanwhile Bendigo moved into the final with a 5 game win over Wodonga. Bendigo defeated Dubbo by five games to take out the Special B 2 division. 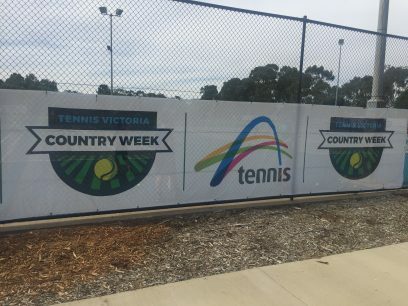 A great week of tennis was enjoyed by all and they will team up again next year at Shepparton. The curator Daniel Gardner walked over 100 kms during the event. 500 scotch fillet steaks were consumed. 2450 chicken & salad rolls were enjoyed. 720 wraps were made using 45kgs of carrots and 192 lettuce with many other fillings. 5000 bottles of water kept players hydrated. 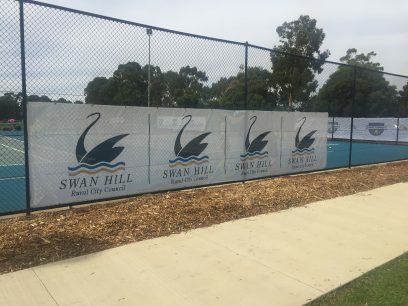 50 plus hardworking volunteers from the Swan Hill Lawn Tennis Club working together with Tennis Victoria event managers contributed to the wonderful event presentation that the club displayed. 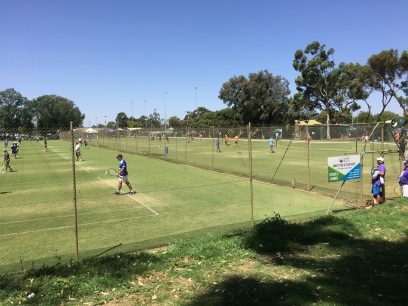 Swan Hill teams had the shortest drive to get to Country Week. Others had a bigger trip with players travelling from as far as the United Kingdom, Darwin, Coffs Harbour and Dubbo. Mick Keogh of Wangaratta is the most senior Country Week player at the age of 80.